Player/Missile Design Aid (PMDA) is a program which aids you in designing your own player/missile graphics. Player/missile graphics are a powerful tool provided by Atari for designing games. However, designing and encoding each player/missile character can be a time-consuming process. Further, using the normal method of designing these players on graph paper, the designer is never sure exactly how the player/missile graphic will look when displayed on the screen. Player/Missile Design Aid was written to facilitate this process and allow the designer to see the player/missile graphic he is designing while he is working on it. Whenever PMDA is awaiting your direction, it shows a blinking cursor on the screen. To move the cursor, simply push the joystick in the direction you wish to move the cursor. The cursor will continue to move in that direction until you release the joystick or push it in a different direction. To start, LOAD the PMDA program and type RUN. PMDA will then display a title screen and begin setting up. Once setup is complete, PMDA displays a screen containing an 8 x 24 bit map which will be used to design your player graphic. Note that a bit which is off (0) is displayed as a plus sign (+) and a bit which is on (1) is displayed as a solid white block. To the immediate left of the bit map is a column of line numbers and to the right is the decimal POKE value for each line. Initially, this latter field is all zeroes. As bits are turned on, however, this will change to correspond to the new value of the line (byte). On the right side of the screen is a list of commands, a status line, and a prompt line which indicates the action to be taken. Some explanation of the status line is in order. The first item is the current player/ missile mode (M=nn). The two digits are the actual decimal value which is POKEd at SDMCTL (559) to produce the desired mode. M=46 indicates that you are in double-line mode (the default); M=62 indicates that you are in single-line mode. The second item is the player size or width (W=n). The digit following is the desired value to be POKEd in the player size register (in this case, SIZEP0 (53256)). W=0 indicates single width (the default); W=1 indicates double width; and W=3 indicates quadruple width. The last item is the color/luminance for the player/missile graphic (COLOR). The digits following are the actual decimal POKE value in the player/missile color register (in this case, PCOLR0 (704)). I would like to point out that I am not attempting to explain player/missile graphics as there has been much information published already on this subject. I am merely attempting to present enough information to enable you to understand the operation of the Player/Missile Design Aid. Finally, we are ready to begin designing our player/missile graphic. Using the joystick, position the blinking cursor to the bit position in the map which is to be changed. Pushing the fire button on the joystick will cause the bit to be flipped from off to on, or vice-versa. As bits are turned on, the actual player/missile graphic will begin to take shape in the area between the bit map display and the command list. It is also possible to "draw" a line in any direction. To accomplish this, position the cursor to the desired starting position of the line, press and hold the fire button, and push the joystick in the desired direction. Remember that if you pass over a bit position which is already on, it will be turned off. 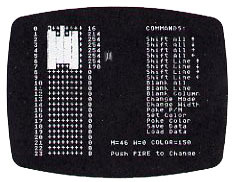 To use the commands (each of which is described later), position the cursor to the first character of the desired command and press the fire button. The command list may be reached by moving the cursor to the left or right until it leaves the bit map display. To return the cursor to the bit map, simply move the joystick left or right. When the player/missile graphic is completed and all options (mode, width, and color) are set correctly, you can either write down the status line settings and the decimal values for each line (byte) of the player/missile graphic or you can use the Save Data command to save this data. The data saved takes the form of a Basic language DATA statement which may be added to your own player/missile graphic program by using the Atari ENTER command. This eliminates the need for a run-time subroutine to load the data. The format of the DATA statement is explained later. Shift All (Up Arrow): Shifts all 24 lines of the graphic up one line and leaves a blank (0) line at line 23. Shift All (Down Arrow): Shifts all 24 lines of the graphic down one line and leaves a blank (0) line at line 0. Shift All (Right Arrow): Shifts all 24 lines of the graphic right one bit position and leaves a blank (0) column of bit positions at the extreme left. Shift All (Left Arrow): Shifts all 24 lines of the graphic left one bit position and leaves a blank (0) column of bit positions at the extreme right. Shift Line (Up Arrow): Shifts all lines from the line you indicate to line 23 up one line and leaves a blank line (0) at line 23. Select the first line to be shifted by positioning the cursor on the desired line and pressing the fire button when prompted by the program. Shift Line (Down Arrow): Shifts all lines from the line you indicate to line 23 down one line and leaves a blank (0) line at the line selected. Line selection is the same as described for Shift Line (Up Arrow) above. Shift Line (Right Arrow): The single line which you select is shifted right one bit position and a 0 bit is left at the extreme left of the line. Line selection is the same as for Shift Line (Up Arrow). Shift Line (Left Arrow): The single line which you select is shifted left one bit position and a 0 bit is left at the extreme right of the line. Line selection is the same as for Shift Line (Up Arrow). Blank All: All bit positions are set to 0. Before proceeding, you will be asked to confirm your request by pressing the fire button. If you do not want the command to proceed, push the joystick in any direction. Blank Line: The single line which you select will have all its bit positions set to 0. Line selection is as described for Shift Line (Up Arrow). Blank Column: The bit position which you select will be set to 0 in all lines. Select the bit position by moving the cursor to the desired position and pressing the fire button when prompted by the program. Change Mode: This changes the mode from double-line (M=46) to single-line (M=62) and vice-versa. Change Width: This changes the player/ missile graphic width from single (W=0) to double (W=1); double to quadruple (W=3); or quadruple to single. POKE P/M: This allows the user to enter a previously-defined character when only the POKE values are known. Use the keyboard to enter the value for each line when prompted by the program. The Return key must be pressed after each value. Enter three nines (999) followed by Return to indicate that you are done. Set Color: This sets the color of the player/missile graphic only. Using the keyboard, enter the Atari color value (0-15) followed by Return, then enter the luminance value (0-14, even numbers only) also followed by Return. These values will be converted to the corresponding color register value and POKEd into PCOLR0 to change the color of the player/missile graphic displayed. POKE Color: This sets the color of the player/missile graphic only. Using the keyboard, enter the decimal value to be POKEd into the player/missile color register. Save Data: This saves the player/missile data as a Basic language DATA statement. The format on this statement is described later. Prior to beginning the operation, you are asked to confirm your intent by pushing the fire button. To cancel the operation, push the joystick in any direction. The data saved include the mode, width, and color settings followed by the POKE values for each line from 0 to the last non-zero line. Load Data: This loads previously-saved player/missile data. Before beginning the operation, you are asked to confirm your intent by pressing the fire button. To cancel the operation, push the joystick in any direction. Upon confirmation, a Blank All operation will be performed. The player/ missile graphic will be loaded and displayed with the same mode, width, and color as were in effect when it was saved. Color? : Use the keyboard to enter the Atari color value and press the Return key. Enter POKE Values: Use the keyboard to enter the POKE values for a player/missile graphic. Press Return after each one and use 999 followed by Return to indicate you are finished. Luminance? : Use the keyboard to enter the Atari luminance value and press Return. No P/M Data to Save: The Save Data command was selected but there are no non-zero bits in the bit map. No action is required. POKE Color? : Use the keyboard to enter the POKE value for the player/missile color register and press the Return key. Pos Cursor for Blank: Position the cursor to the line/column to be blanked and press the fire button to complete the Blank command. Pos Cursor for Shift: Position the cursor to the appropriate line for the Shift operation and press the fire button to complete the Shift command. Processing...: A long-running command is executing. No action is required. Push FIRE to Change: The cursor is located within the bit map and pressing the fire button will cause the bit at the cursor position to be flipped. Push FIRE to Confirm: A Blank All, Save Data, or Load Data command has been selected and pressing the fire button will cause the command to continue. The command may be cancelled by pushing the joystick in any direction. Push FIRE to Select: The cursor is located within the command list and pressing the fire button will cause the command at which the cursor is positioned to be executed. Ready Tape Recorder: Insert a cassette tape, press Play or Record and Play depending on the operation selected, and press the console Return key. Lineno is the line number. The first save will create a statement with a line number of 32000. For each subsequent save, the line number is incremented by 10. DATA is written as shown to identify the Basic language statement type. Mode is the POKE value for the player/ missile mode (double-line or single-line). Width is the POKE value for the player/ missile size register. Color is the POKE value for the player/ missile color register. Data0 is the POKE value needed to create line 0 of the player/missile graphic. Data1 is the POKE value needed to create line 1 of the player/missile graphic. Datan is the POKE value needed to create line n of the player/missile graphic. The last line saved is the last non-zero line found in the bit map. Leading zero lines and any zero lines within the body of the player/missile graphic will be saved. -1 is written as shown to indicate the end of the player/missile data. 20 ? #6;"     DESIGN AID":? #6:? #6:? #6;"        -BY-":? #6:? #6;"     TOM GURAK"
100 DIM B$(1),I$(1),S$(6),A$(4),L$(5),C$(6):B$="+":I$="�":S$="Shift ":A$="All ":L$="Line ":C$="Blank "
120 DIM P$(13),Q$(15),T$(7):P$="Push FIRE to ":Q$="Pos Cursor for "
Tom Gurak, 24 North St., W. Albany, NY 12205.